Examining Triassic Age Bone Bed. Customers receive regular promotional offers and updates of new listings. "Hi Angelos! My second consignment from you arrived safe and well this morning, your packaging in ensuring these excellent specimens arrive safely is second to none. I feel quite safe in saying the fossil specimens you have on offer far surpass anything else on the internet in terms of quality. To say they are superb is an understatement. 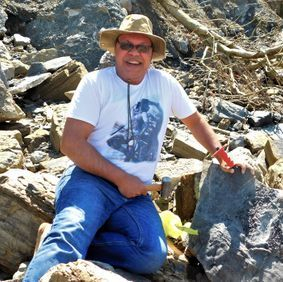 It is obvious that the care and attention to detail of the fossils, and the knowledge displayed on your splendid website reflects all the excellent feedback from your customers. Thank you again, I will be back again! David". E R Matheau-Raven. 131 New Road, Woodston, Peterborough, Cambridgeshire, PE2 9HE, England, UK. PayPal - service to make fast, easy and secure payments for your purchases.